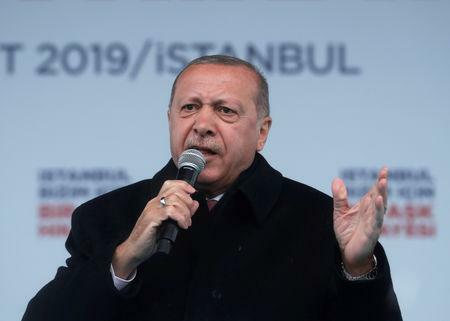 ANKARA (Reuters) - President Tayyip Erdogan on Tuesday called on New Zealand to restore the death penalty for the gunman who killed 50 people at two Christchurch mosques, warning that Turkey would make the attacker pay for his act if New Zealand did not. "You heinously killed 50 of our siblings. You will pay for this. If New Zealand doesn't make you, we know how to make you pay one way or another," Erdogan told an election rally of thousands in northern Turkey. He did not elaborate. He said Turkey was wrong to have abolished the death penalty 15 years ago, and added that New Zealand should make legal arrangements so that the Christchurch gunman could face capital punishment. "If the New Zealand parliament doesn't make this decision I will continue to argue this with them constantly. The necessary action needs to be taken," he said. Erdogan is seeking to drum up support for his Islamist-rooted AK Party in March 31 local elections. At weekend election rallies he showed video footage of the shootings which the gunman had broadcast on Facebook, as well as extracts from a "manifesto" posted by the attacker and later taken down. That earned a rebuke from New Zealand Foreign Minister Winston Peters, who said he told Turkey's foreign minister and vice president that showing the video could endanger New Zealanders abroad. Despite Peters' intervention, an extract from the manifesto was flashed up on a screen at Erdogan's rally again on Tuesday, as well as brief footage of the gunman entering one of the mosques and shooting as he approached the door. Erdogan has said the gunman issued threats against Turkey and the president himself, and wanted to drive Turks from Turkey's northwestern, European region. Majority Muslim Turkey's largest city, Istanbul, is split between an Asian part east of the Bosphorus, and a European half to the west. Erdogan's AK Party, which has dominated Turkish politics for more than 16 years, is battling for votes as the economy tips into recession after years of strong growth. Erdogan has cast the local elections as a "matter of survival" in the face of threats including Kurdish militants, Islamophobia and incidents such as the New Zealand shootings.